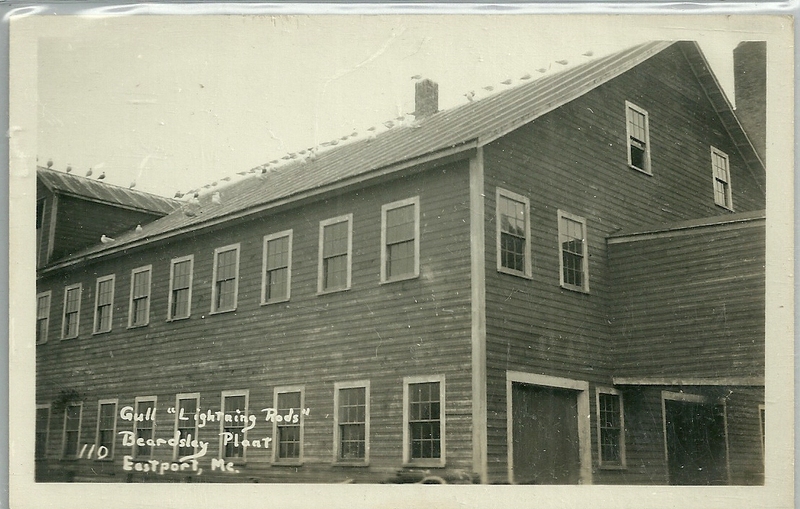 Real Photo Postcard showing the Beardsley Sardine Factory at Eastport, Maine. The postcard calls attention to the many "lightning rod" seagulls on the roof. I believe the Beardsley plant was located in the area of where the ferry nows lands in the North End of Eastport. The building no longer exists; there's a restaurant and wharf complex there now. Justus W. Beardsley started the plant in the 1870s to process sardines and boneless herring. He was born in New Jersey in 1813, the son of Morrison and Catherine (Woodhull or Woodhouse) Beardsley of New Jersey. In 1833, he married Cemantha Riggs, who was also born in New Jersey in 1813, the daughter of Samuel and Susan (Van Campen) Riggs. Justus and Cemantha had at least two children, a son and a daughter. The son, George Austin Beardsley, a Civil War veteran, was also involved in the operation of the Beardsley plant at Eastport, Maine, as was his son George Austin Beardsley, whose mother was Henrietta C. (Burnett) Beardsley. Grewing up in the area my brothers and I spent many hours in the and around the cove at the Beardsky's Factory. I remember in the late 1940's catching large haddock with a hand line off the end of Beardsly's wharf. In that era 1940 - 1950's the Wentworth and Malloch brothers worked in the factory mixing and canning cod fish cakes under the Beardsly's label. Interesting! I think it would be cause for celebration if you caught a haddock there now, sadly... The fisheries sure have changed, and not for the better. I hope that Anonymous will receive your reply, Donna. I'd like to know, too!